Back in 2009, we made our very first trip to Drayton Manor and Thomas Land with a two-year-old Roo. That very first trip sparked our love for the theme park and every year since we have visited at least once (if not more). We have enjoyed the magic of Thomas Land when Roo was younger and now Tigger as he is starting to get a real taste for rides. As Roo has grown older she has developed a thirst for more thrilling rides and enjoys the range of different rollercoasters and rides available within Drayton Manor. Last year we attended the opening of the Thomas Land expansion, which was lovely to see how the park is developing over the years we have been visiting. The new area is large and open allowing you to walk around the rides within feeling on top of everyone or in the way if you are waiting for someone to come off a ride. Following our visit to the expansion we were very lucky to be chosen as Drayton Manor Theme Park 2015 Blogger Ambassador for which we received a Drayton Manor Season Pass Plus for each of the Boo Roo and Tigger Too household. Drayton Manor offers two tiers when it comes to their Season Pass; a standard Season Pass and the Season Pass Plus. The main difference between the two pass types is when they can be used. The standard Season Pass allows unlimited access to the park* between 12th March 2016 – 28th October 2016 with discounted tickets offered for special events including the Firework Spectacular and Magical Christmas. The past year has seen us as a family make the most of our Drayton Manor Season Pass, we have attended the park, at least, six times throughout the year. Taking advantage of the fun-filled rides within Thomas Land, the thrilling rides within Drayton Manor and enjoyed walking around the Drayton Manor zoo. Both Roo and Tigger have made the most of their time within the park, so much so that they have an order of how they like to complete the first few rides of the day. Harold the helicopter, Cranky the Crane, the spinning Diesels before heading into the expansion area to enjoy some of the newer Thomas Land rides. After which we usually split up with Roo and Mr Boo heading into Drayton Manor to enjoy the bigger rides, with Tigger and I jumping onto Thomas or Percy to head to the other side of the park. Sadly as I was heavily pregnant with Piglet we missed the fireworks spectacular, which we have previously attended for the past two years. This season finale was billed to be the biggest yet, especially as they were celebrating the 65th anniversary of Drayton Manor. In all the years we have been visiting Drayton Manor we have never managed to make it to the Magical Christmas event held in December. This year it is on our family bucket list to do so fingers crossed we will finally get to see Santa, tell him our present requests before heading back onto the rides. 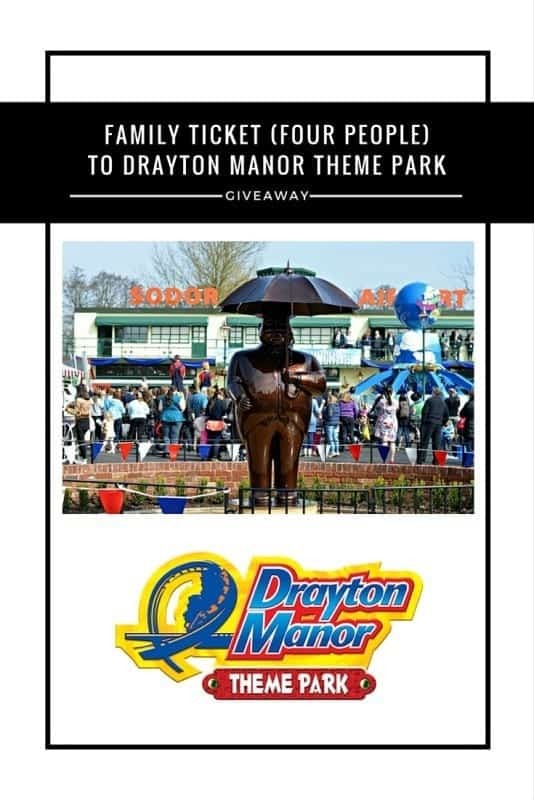 To celebrate the launch of the new Drayton Manor 2016 Season Pass, Boo Roo and Tigger Too are lucky enough to have a family entry ticket (four people) to giveaway to hopefully ignite your love for Drayton Manor and Thomas Land. Apart from the obvious of being able to go all the time – the discounts in the retail and catering areas is great!! I like it as there is so much to see that it’s difficult to fit it all into one visit. Also Drayton Manor is a favourite of ours because it caters for all our children aged 4 to 14, there’s something for everyone 🙂 And i have a Thomas-mad little boy too! Fingers crossed! I love that Drayton Manor has rides for the older ones and Thomas Land for the little ones, enough to keep everyone happy! We love Drayton Manor, My youngest loves Thomas Land, but most of all the bertie bus ride, my son loves a ride on the cable car and my oldest loves the big pirate ship!!! I love the discounts in the catering outlets, making lunch cheaper as well. Number of trips not limited so don’t have to squeeze everything into one day. The fact that you can just jump in you car on a weekend and go. I and the hubby both work hard and have two beautiful children we struggle to afford days out so having a pass like this is amazing it means we can enjoy days out whenever we like trip to Thomas land and the zoo would be perfect for our children… I also like the fact we could take extra people with us and they would only have to pay £18 which is fab. Free entry to the park for a whole year would be amazing. My son loved our last visit. I like the extra vouchers. Great if you have friends or famiily to stay. There is really something for everyone! We would love to keep going back and back, with this you can and not worry about having to keep buying the entrance tickets. would give this to niece and family, as i think they would enjoy this very much!! Thomas Land, as a Thomas is a family favourite. Definitely the unlimited access to the park. The 10 Family & Friends Vouchers are good so you can take different people each time you go. It’s such great value and for me local too. It has to be thet unlimited entry between March and October. Although the 10 guest pass entries is really good too. I love the fact it allows you ten friends and family with just one son at home he always wanted to bring a friend to. the unlimited park access makes me like it. its great value for money! Being able to visit during the different seasons. Plus it is great value for money! I love that the pass also includes the fireworks and the magical christmas. Unlimited access to the park. Unlimited park access and great value for money! Think Season passes are great especially if you live near the Park so you can pop in when you want. Excellent value for money! The discounts for other things and family friends are brilliant too. There’s a few things I think are brill, unlimited access to the park,discount in shops, tho I think my favourite is discount passes for family and friends, what’s a day out without good company. 20% off at The Grill Inn and hotel restaurants is my faovurite part! So free entry and reduced food – sounds like the perfect visit to me! I love the aspect that you can visit the park whenever you fancy/have a free day without having to budget in advance as it’s already paid for. Having unlimited access to the park and not feeling like you have to stay all day to get your moneys-worth! Unlimited park access – such great value for money! I never been to Drayton but OI think it will be a great place for my family now. My girls love the rides! The unlimited park access, great for school holidays. Unlimited access to the park – lots of trips spread throughout the year to break up those long school holidays! The unlimited access and the great value for money! I like that you have 10 guest passes it’s nice to go with friends sometimes. It would be great to entertain our two children with the variety of rides for their age! I like the idea of 20% off catering outlets, makes the prices a little bit more realistic. I’ve got 2 nephews and 4 cousins who I know would love unlimited park access. It is fantastic to have the chance to come and go as you please, for not much more than the price of a single entry, it’s a bargain! just to be able to go when you want and not having to worry about seeing everything in one day. you can come back! I love the fact you can visit as much as you want and also that you can give friends a discount so they can come along too. I love that the season pass plus can also be used for the fireworks and Christmas. It would be great to go to both of those as well as a day out on the summer, without paying separately each time. I love that I can choose a day to go and just go. Love Drayton manor the zoo is fab too. I love that you can go whenever you want to. We visit Drayton Manor a couple of times a year, including Christmas, but it is just not enough as we love it there. It’s only 45 minutes away from us to perfect for a last minute family day out! My children would love that they could go so often! I think the extras included in the plus pass like the Fireworks Spectacular weekend and Father Christmas experience is a great bonus, well worth the extra to have those included. ooooh I can almost smell the summer with the thought of Drayton Manor!!!! With five grandchildren I will be able to take them all at various times. I like the fact that there is so much to do that each time we visit we can discover new things! That you can also get discounts in the restaurants/hotels with it. 10 x friends and family vouchers per season pass is a fantastic feature. Being able to just go for a few hours if we want something to do and not feeling like we need to stay to get our monies worth! Being able to just pop in for the afternoon and come back when we like. All the family love the park something for everyone. This place is fab for my youngest and for my older 2 boys. I like the idea of the two different season tickets. 20% off food and gifts is a good draw for me as this is where we spend the most. Unlimited access to the park* from 12th March 2016 – 28th October 2016. Would absolutely love to win this, been looking to go to a theme park for a day out in 2016 and never been to Drayton Manor. Being able to just jump in the car regardless of whether its 3 weeks till pay day would be fab! They seem very reasonably priced too! The 20% off at food outlets! One less thing to worry about on our day out! I love the unlimited visits through those warmer months! 20% off in all park catering outlets. Always seem to spend so much on food and drink when we go – so this is a nice discount! I love the ‘unlimited access’ aspect which means you can visit at your choice in accordance with the dry weather. Love having access to visit whenever we want – we love Drayton Manor its only 10 minutes away but its so expensive its a real treat when we do go! Being able to go any time we feel at a loose end! The 20% off various things in the park is very appealing. It’s local, and the rides are great fun. When visiting a theme park, I often feel you have to use every hour of daylight on order to justify the cost of entry! With a pass that aspect has gone and therefore you can enjoy as little or as much time there as you prefer. Unlimited access to the park is my fave feature and would definately get a lot of use if i won! The 20% off at The Grill Inn and hotel restaurants is very handy! Going as much as possible. I had a few ‘dates’ as a teen at Drayton Manor!! I grew up 6 miles away. we live an hour away now and took the kids last season and stayed at the hotel. That we can visit as many times as we like! The fact that its a pass so we don’t have to rush around to see everything in one day ! Having 3 kids of different ages they all love something different so we can spend time in Thomas Land, and on the ‘Big Rides’! Fab prize! Good luck everyone! Being able to go back without paying again. You don;t feel like you have to cram everything into one visit! As we live only half an hour’s drive from Drayton Manor, I like Unlimited access to the park* from 12th March 2016 – 28th October 2016 best. I love the unlimited access to the park it’s great being able to go as much as we want without worrying about the cost. Unlimited access to the park would be my favourite aspect of the Season pass. My little girl loves Drayton Manor (as do the rest of us) and this would be one of the most amazing things ever. Being able to go to drayton manor on an unlimited basis and spontaneously when looking for something to do. The fact that it’s such great value considering I can make as many videos as I want ! Oh my what a fabulous prize! My little boy would adore this.. To be honest, so would I! Haha we are big fans of Thomas! Being able to visit when we want and money saving! The chance for Grandma and Grandad to share the excitement and enjoyment. The unlimited access which is great for us as we’re only 15 minutes away and it’s definitely one of our favourite family day’s out! A value for money family day out! Thomas Land! My children love this area! Have really enjoyed the Christmas days at Drayton Manor so inclusion of them as well as unlimited trips sounds great! Oo I’ve never been, would love to win this and go! The unlimited access would be the best thing, everything else is just a bonus. My son would be the happiest little boy ever! All aspects just fun fun fun ! I love it that the fun never has to end!! I love the fact that you have unlimited access and that you can give a little kindness back to family and friends with the vouchers you get with it! All the extras that come with it, being able to take other friends along too for a truly amazing year of days out.